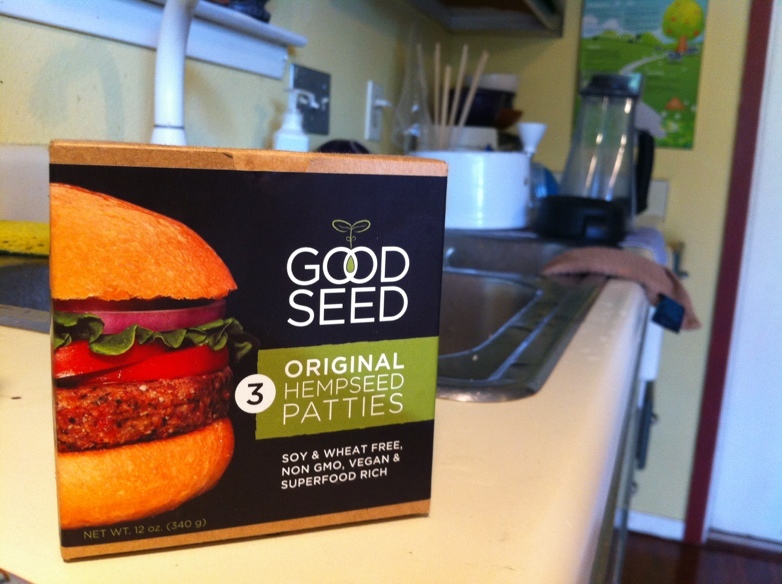 I’ve been helping out Rebecca, the owner of Green Island Catering (a vegan catering company), and she started making these pre-packed foods. 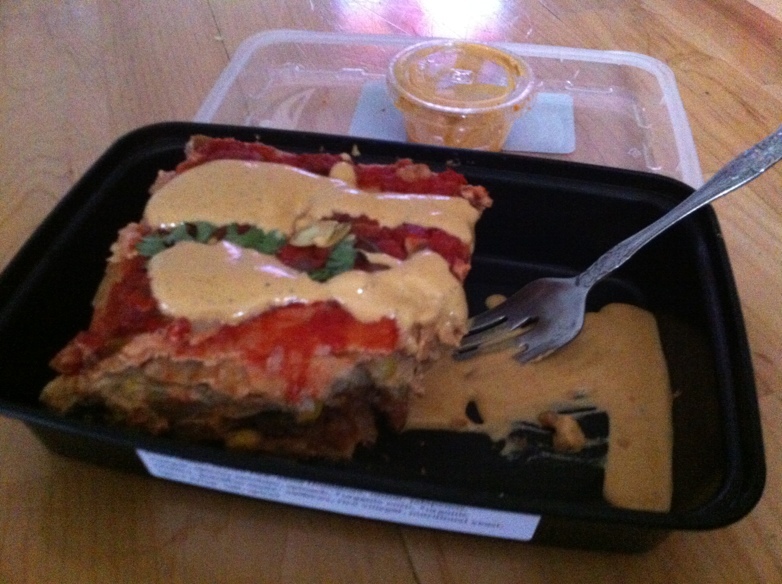 I got to try one – the stacked enchiladas – and it was truly excellent. The portion was huge and it had this creamy cashew-based “cheese” sauce that was so silky and delicious with a little spicy punch. The enchiladas had beans, corn, zucchini, and rice stacked between corn tortillas. The whole thing is gluten-free, too! Rebecca is trying to get broader distribution, but she is currently selling them through Daily Juice on North Loop. So check it out and let the manager know how awesome it is! 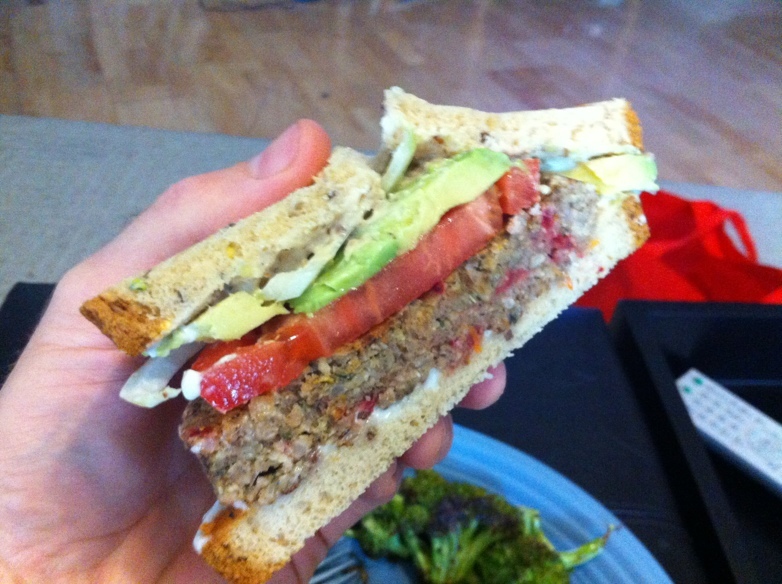 Eating this reminds me of one reason I decided to almost totally cut out my animal product consumption. It’s because eating plant-based food feels so much more wholesome. It doesn’t feel like a brick in my stomach like you get from meat and cheese. Plus you get more nutrients and when it’s well done you get more flavor, like in these enchiladas! 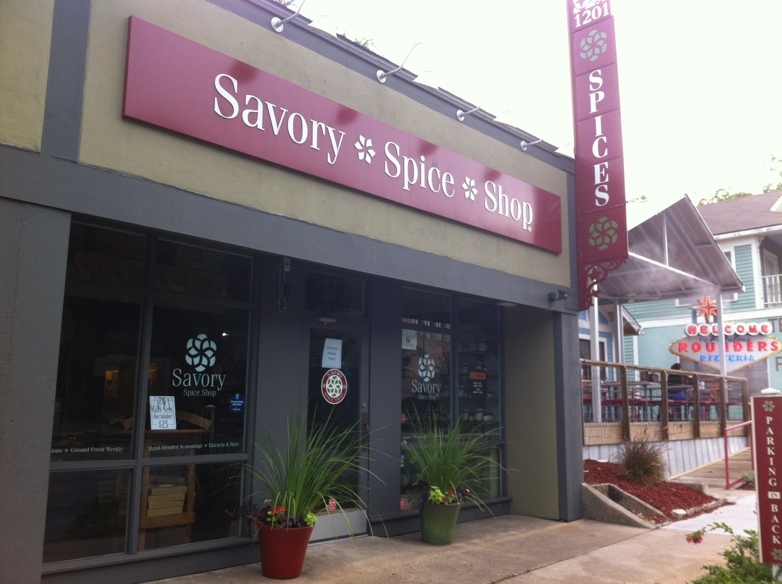 Austin has such a vibrant food scene and I got to see a new slice of it recently when I attended a Slow Food Austin “Slow Session” at the Savory Spice Shop. 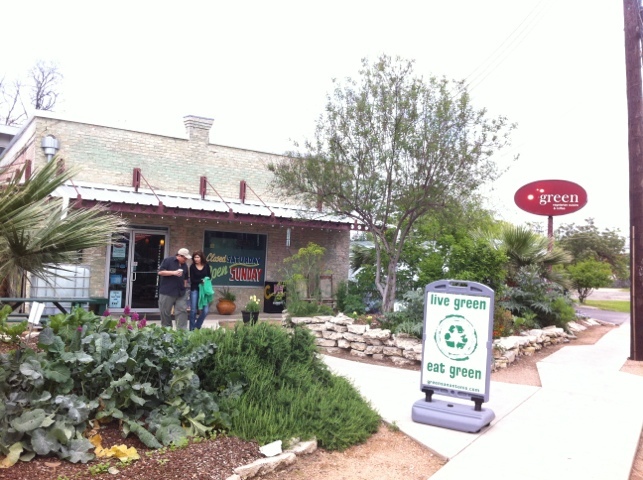 The shop is just a couple of blocks west of the Whole Foods Market in downtown Austin. 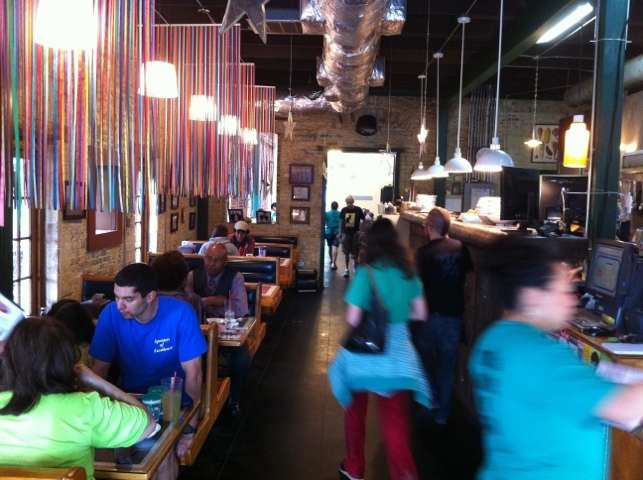 It’s located in the quiet but well foodie-fied West Sixth area, which also features Cafe Josie, Z’Tejas, and Sweetish Hill Bakery, to name a few of the better-known eateries. 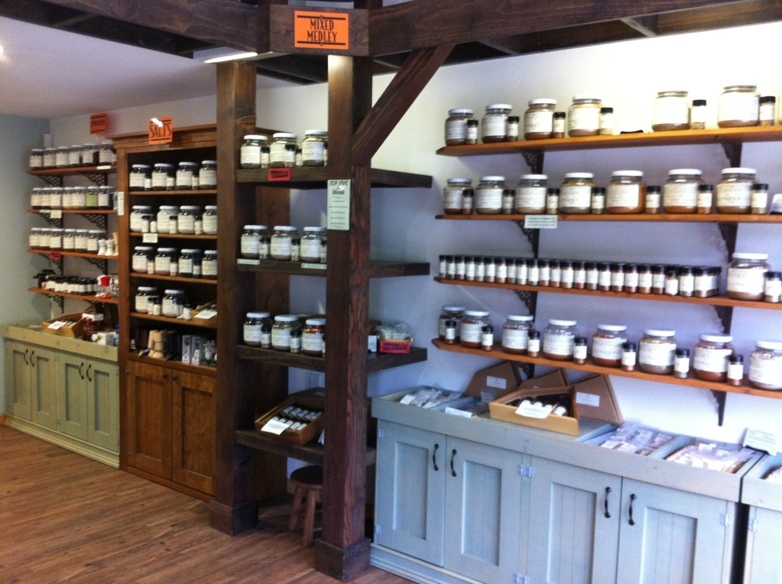 The shop has a lot of spices for sale – specialty salts, dried herbs, and ground spices. I was able to find some asafoetida and kaffir lime leaves. Yay! 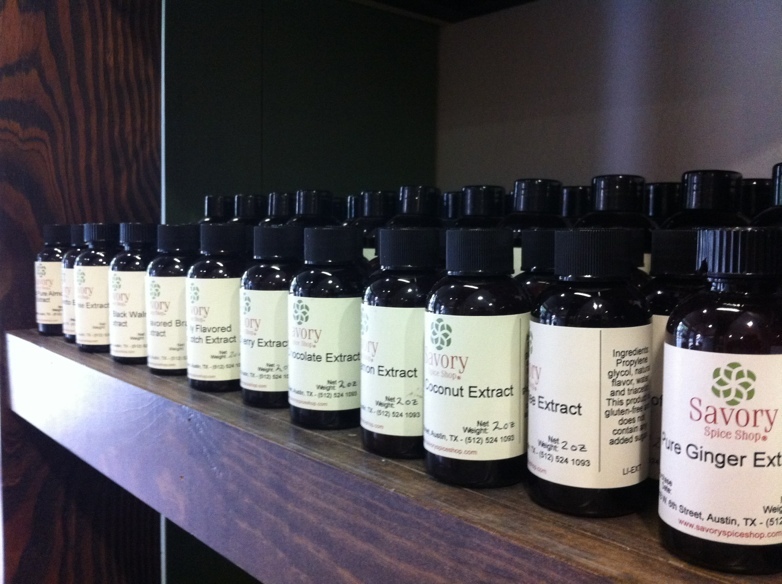 Below: They have just about any extract you could want. 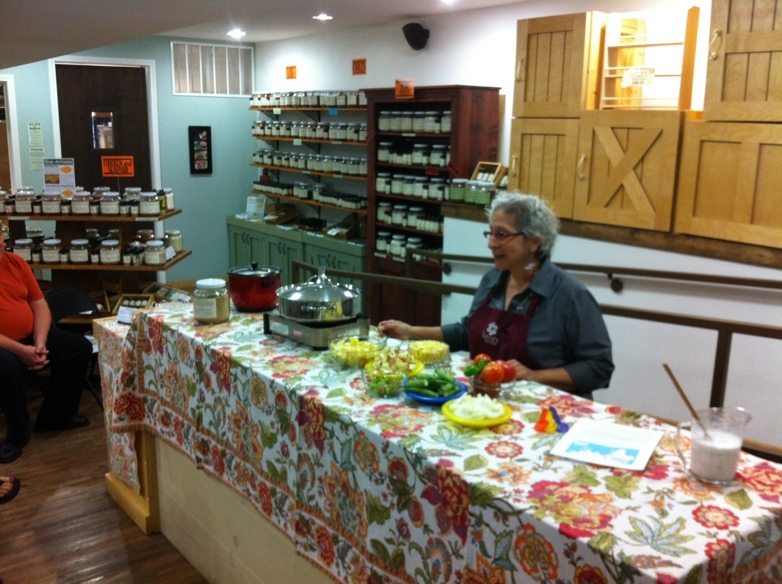 Below: Karen, the owner, did a cooking demonstration – two curries using the shop’s spice blends. 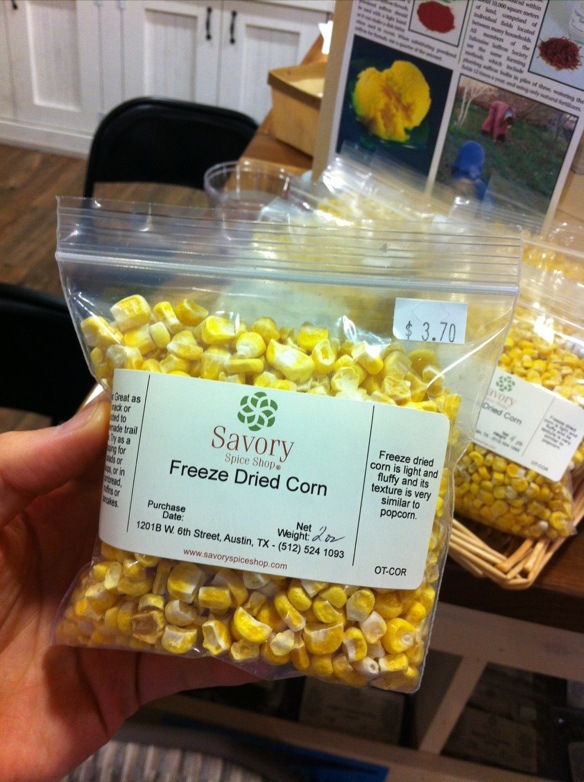 Below: The shop sells this freeze dried corn that tastes just like popcorn. 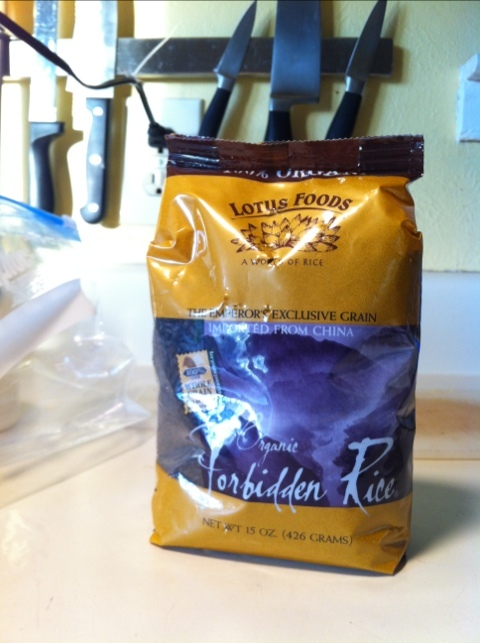 Crunchy and light – mmm! You can taste a sample of this and anything else in the store. After several months of blogging I can’t believe I never got around to posting about Mr. Natural! 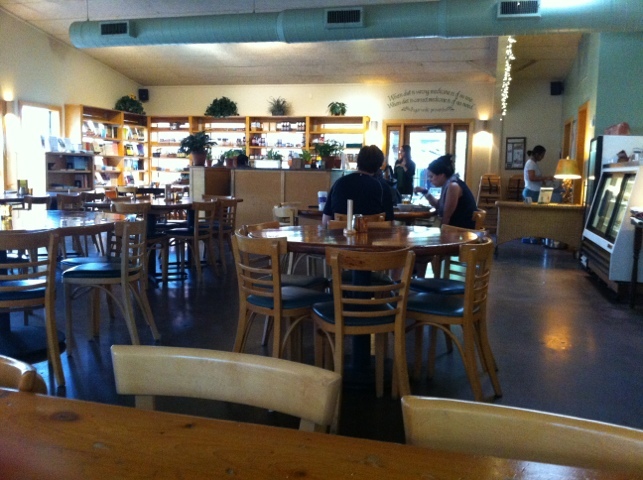 Mr. Natural is a vegetarian restaurant less than a mile from The Natural Epicurean and a favorite stop for students. 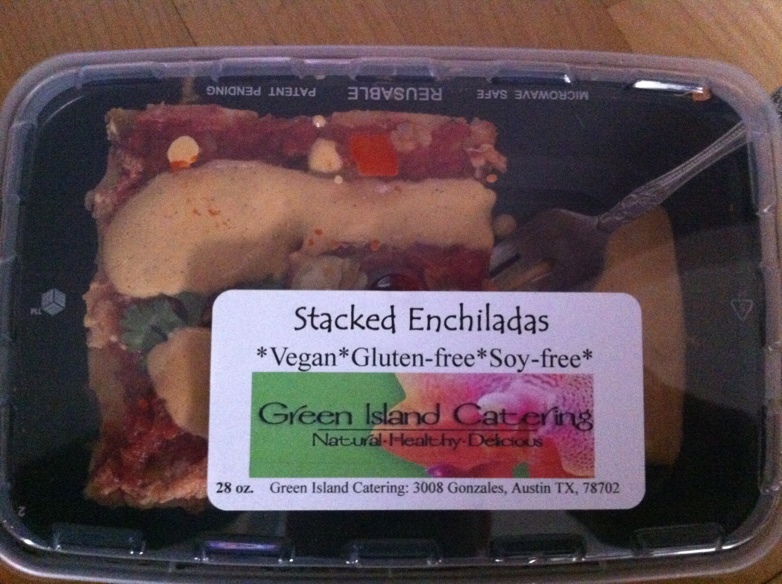 I’ve loved their healthy spin on Mexican, Latin, and more since I moved to Austin five years ago. They have great smoothies, baked goods (including gluten free and vegan) and other stuff, too. The East location even has yoga and meditation classes. 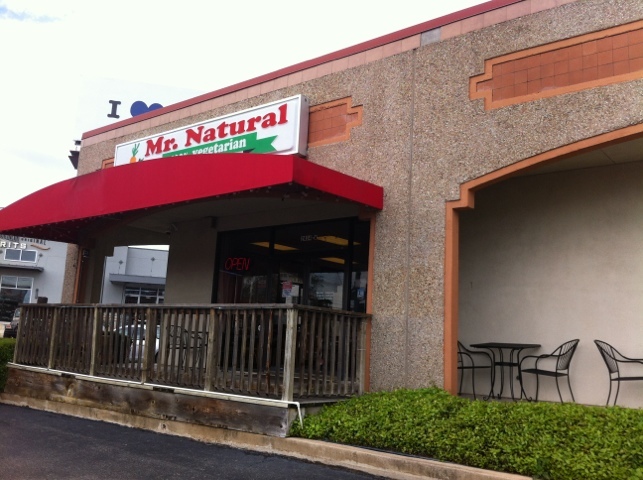 Below: One of two Mr. Natural locations in Austin. Notice the little “I (heart)” peeking out from behind the store. How nice! 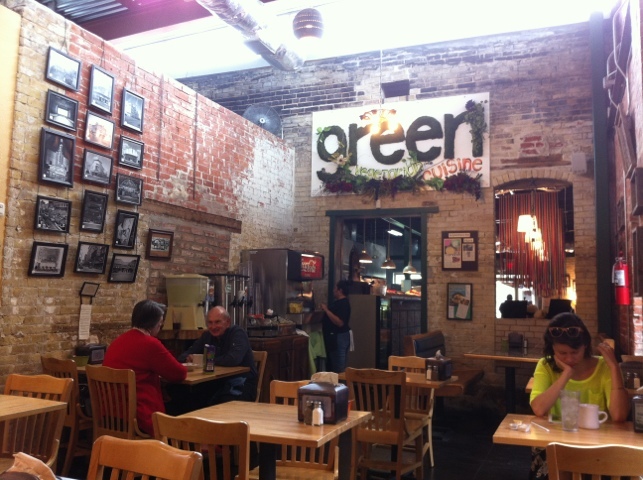 Some people think Texas has no vegetarian scene, what with the BBQ, the prevalence of conservative politics, the oil industry and all that non-Earthy-feel-good type stuff, but Texas has its share of conscious-cooking restaurants. And they’re not all in Austin. 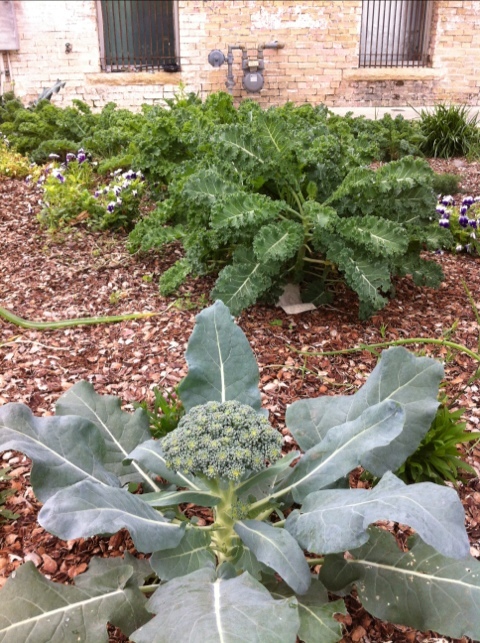 Take Green in San Antonio, for example. 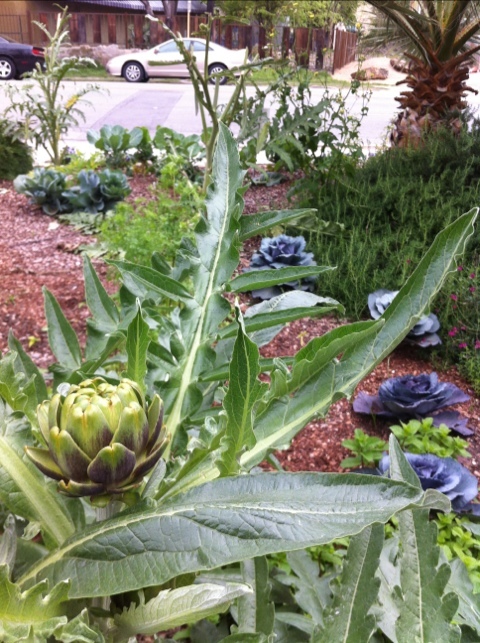 Outside the restaurant, they are growing a wide array of edible plants – kale, cabbage, artichoke, even figs. 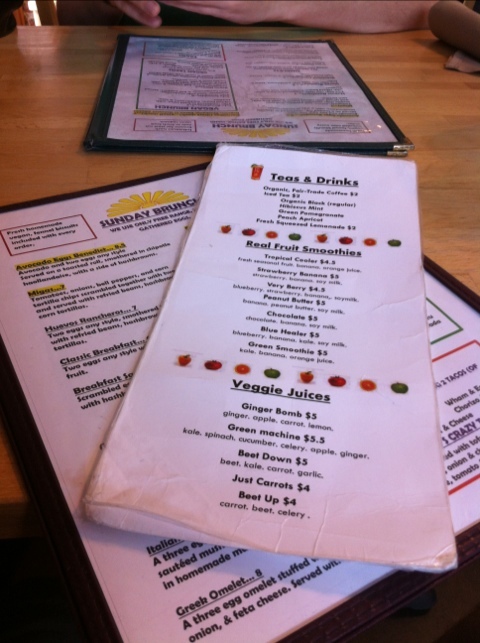 They serve several types of juices and lots of vegetarian fare. Plus, it’s all Kosher. 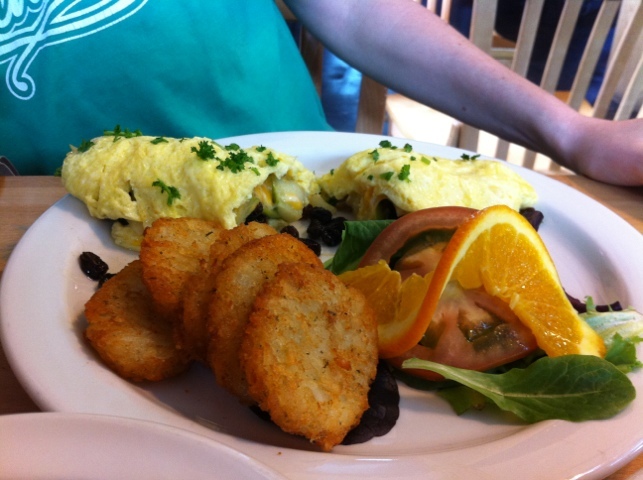 Below: Okay, so hash browns and an omelet aren’t necessarily health food, but even vegetarians want comforting foods when they take a day trip. 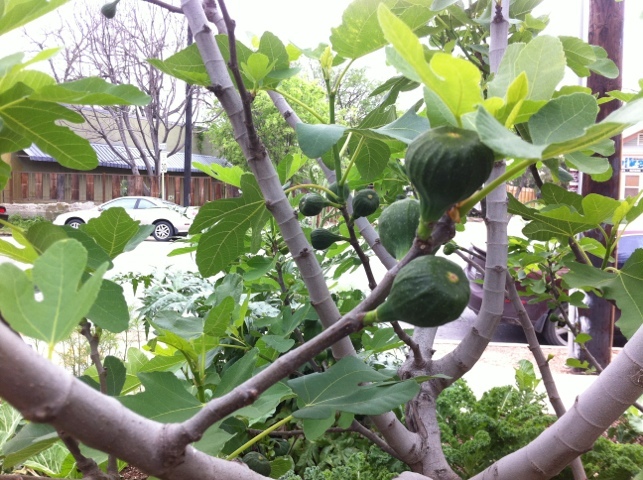 I had a day off Friday from class, so I volunteered in the morning at Casa de Luz, Austin’s premiere (and possibly only) macrobiotic restaurant. 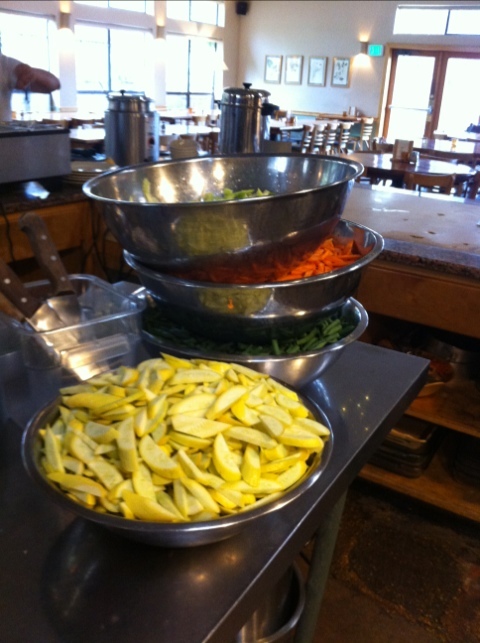 Casa de Luz was how I heard about The Natural Epicurean culinary school, so in a large sense, it was very instrumental in my life! 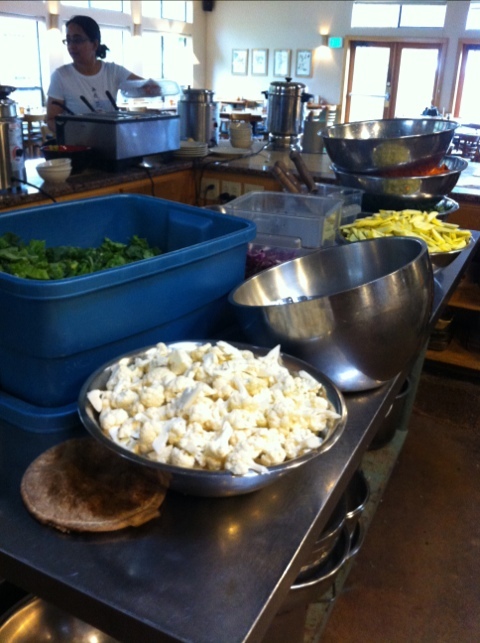 The food was so delicious and nourishing, and the space was so tranquil and enriching, that I had to know how I could learn those skills. Volunteering at Casa means chopping veggies for three hours and at the end getting a free lunch (or dinner, if you volunteer in the afternoon). 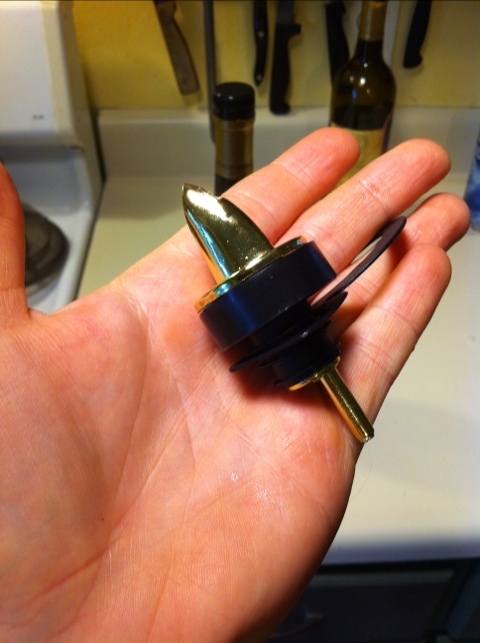 I figured it would be a good chance to practice higher volume chopping. I got what I bargained for there! And the meal was fabulous as usual. 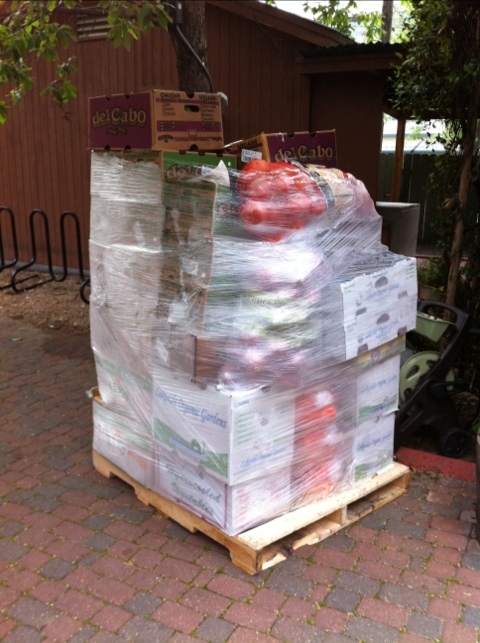 Below: A pallet of fresh vegetables delivered to Casa that I noticed as I entered the restaurant. 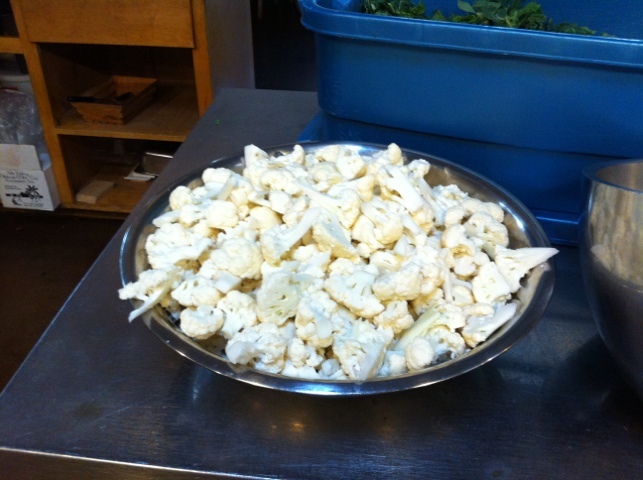 Below: Cauliflower that I chopped. I’m not sure where this ended up. 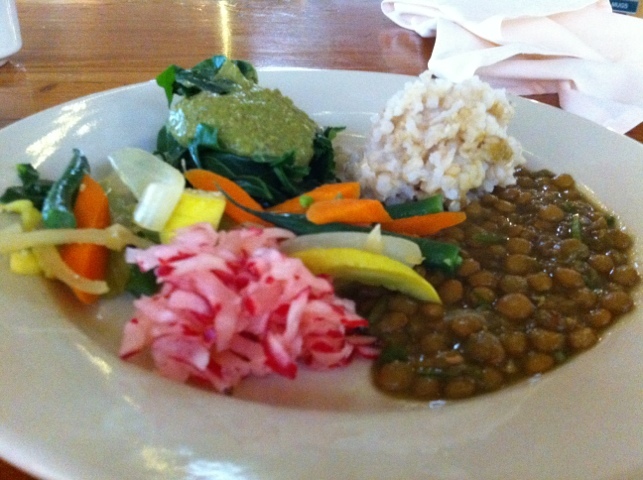 The meal below is a great example of balance on a plate. 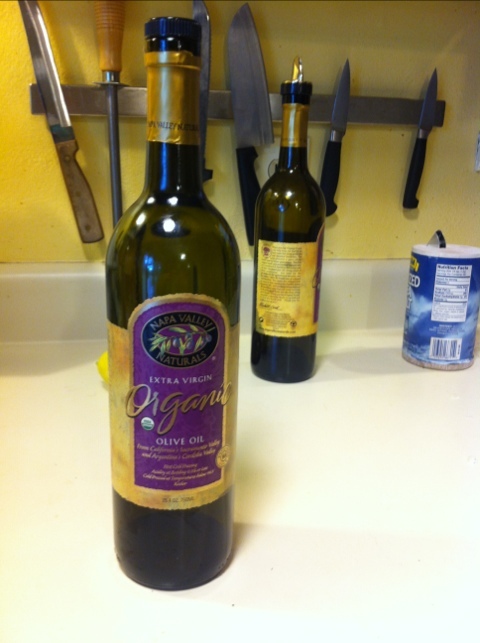 To feel truly satisfied after a meal, one needs a balance of tastes and mouthfeel plus nutrients. Popcorn as a meal doesn’t work – it’s a simple flavor (buttery, salty) and one texture (crunchy/starchy) over and over again. Plus, it’s very light on nutritive elements. As a meal, it doesn’t work. Believe me, in desperation, I have tried. 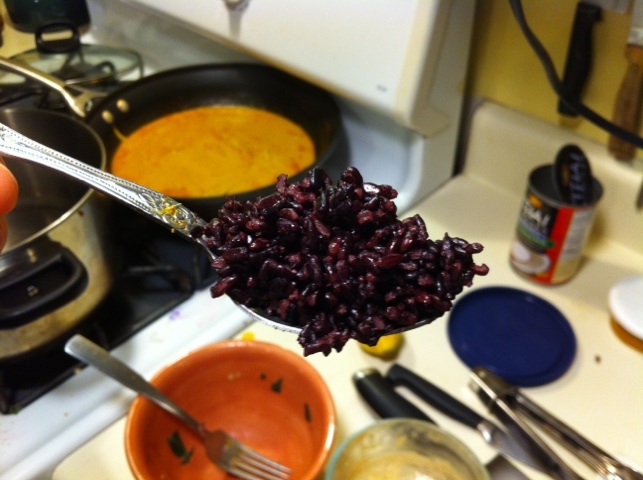 This meal, however has warm and cool, crunchy and smooth, acid and neutral. It even has the slight sweetness of root vegetables and the saltiness to contrast against. In macrobiotics, overly sweet food is generally not suggested, but every plate has some element of sweetness to maintain balance. 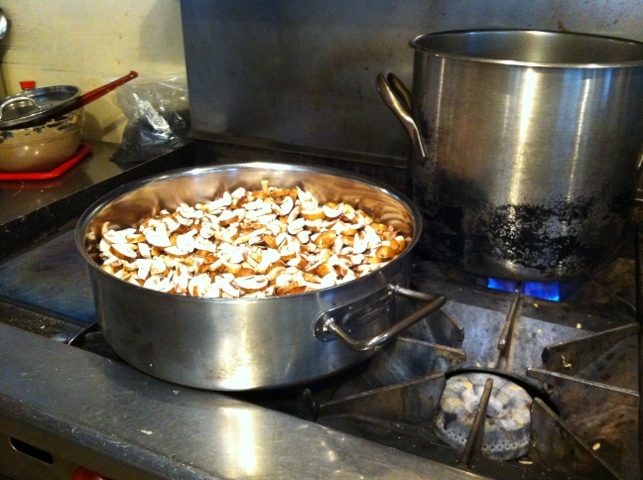 Japanese sweet potatoes are a great example of this that I’ve seen used at Casa de Luz. 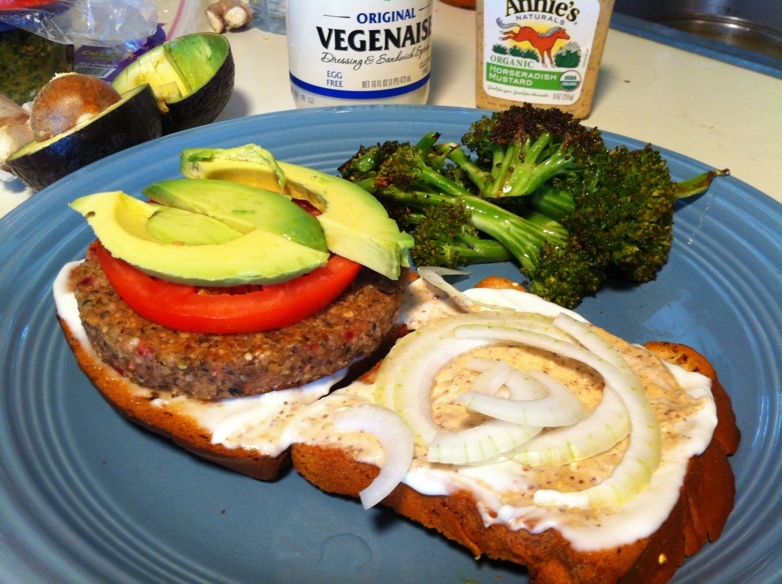 As for nutrients, this plate is loaded with carbs, protein, fiber, and an adequate amount of fat. If I had a choice between this plate and almost anything else, I would choose this. I might need a second helping, though. Below: What a meal, and I helped make it! Blanched greens with a nut/seed sauce on top (just made a similar sauce in class called sun cheese, which is also used at Casa), short-grain brown rice, lentils with cilantro (amazing), pickled radish that I chopped, and steamed veggies. Below: I love the natural lighting at Casa de Luz. Maybe that’s where they got the name from! 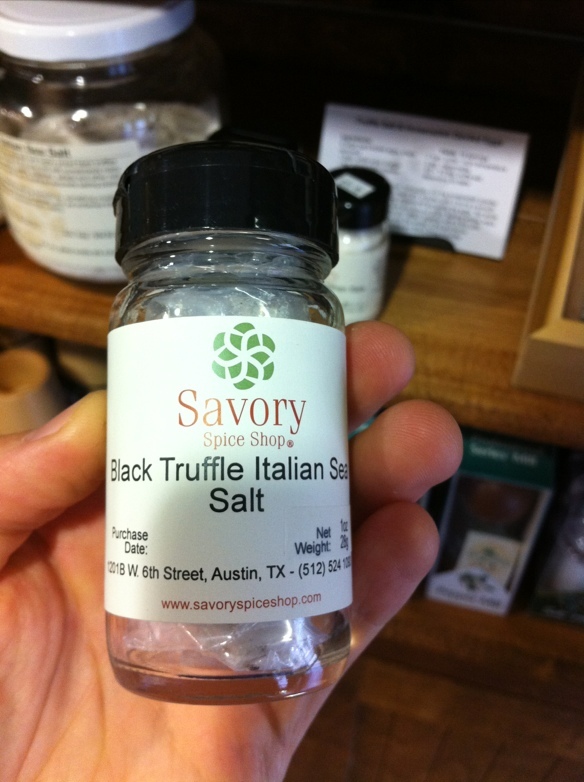 I’ve been curious about the topic of flavor lately – what are its elements? 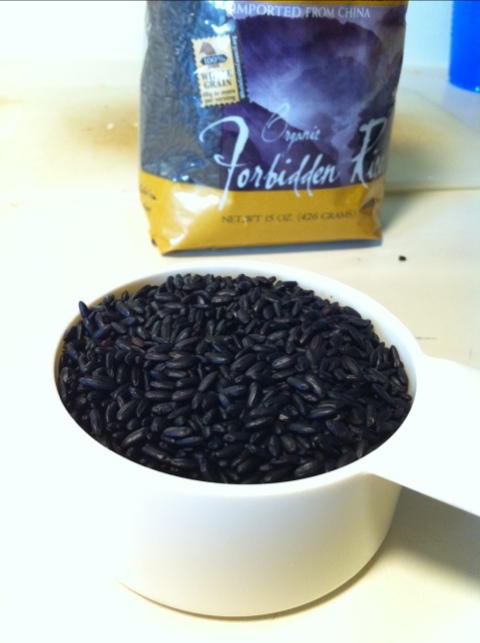 How can I fully appreciate the flavor of a certain food? 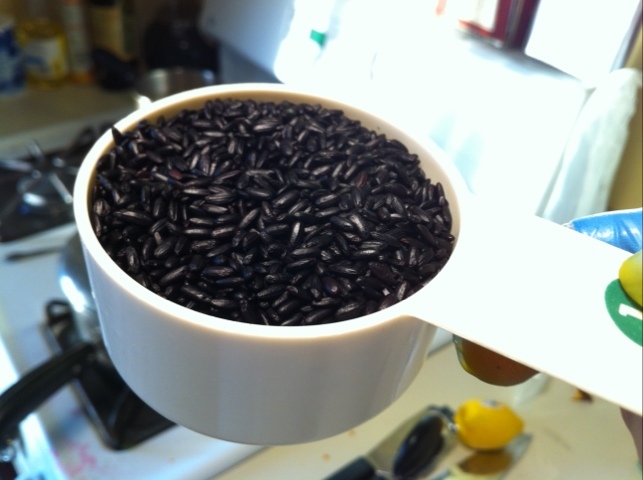 How can I enhance the flavors in something that I cook? 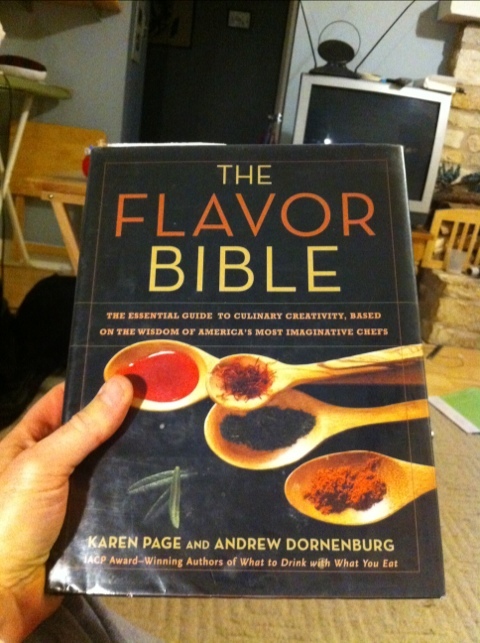 I picked up a copy of The Flavor Bible, and did some internet research to help me better understand the topic.